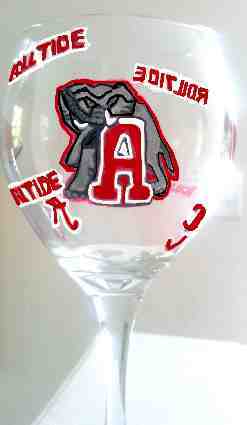 Hand painted Clemson University Clemson University Football Glasses painted with their beloved fighting tiger mascot. Clearly Susan hand paints the Clemson Football Sports Glasses in the bright orange and purple color on helmets, shirt and football logo. Rivals are South Carolina Gamecocks football, Georgia Tech Yellow Jackets football, Florida State Seminoles. "In the early 1960s, the rock was given to then head coach Frank Howard by a friend, Samuel Columbus Jones (Clemson Class of 1919). It was presented to Howard by Jones, saying "Here's a rock from Death Valley, California, to Death Valley, South Carolina." Howard didn't think anything else about the rock and it was used as a door stop in his office for several years. In September 1966, while cleaning out his office, Howard noticed the rock and told IPTAY executive director Gene Willimon, "Take this rock and throw it over the fence or out in the ditch...do something with it, but get it out of my office. "Willimon had the rock placed on a pedestal at the top of the east endzone hill that the team ran down to enter the field for games. On September 24, 1966, the first time Clemson players ran by the rock, they beat conference rival Virginia, Howard, seizing on the motivational potential of "The Rock", told his players, "Give me 110% or keep your filthy hands off of my rock." The team started rubbing the Rock for the first game of 1967, which was a 23-6 waxing of ACC foe Wake Forest." "As a result, it is now a tradition for the Clemson Army ROTC to protect the Rock for the 24 hours prior to the Clemson-South Carolina game when held in Death Valley. ROTC cadets keep a steady drum cadence around the rock prior to the game, which can be heard across the campus. Part of the tradition comes after unknown parties vandalized the Rock prior to the 1992 South Carolina-Clemson game. On June 2, 2013, Howard's Rock was again vandalized when the case containing it was broken and a portion of the rock was removed by an apparent fan of the Tigers, who was eventually arrested following a police investigation."